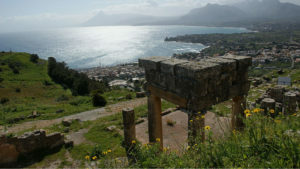 Situated just to the east of Palermo near Bagheria, Kfra, as Solunto was originally known, was, along with Mothya and Panormus (now Palermo), built by the Phoenecians in about 700BC. As was his wont, Dionysus the Elder, Tyrant of Siracusa, sacked Solunto in 397BC before returning a year later to completely rebuild it. The Greeks were eventually usurped by the Romans in 254BC during the First Punic War and, according to Cicero, the town soon had the status of a civitas decumana or “large town”. For unknown reasons the town was slowly abandoned towards the end of the 3rd Century AD and was re-discovered only in the 16th Century. Excavations have continued ever since. Dionysus built a classic Greek-style town – a grid network centring on the main thoroughfare Via dell’Agora which led to the marketplace. This street, which was widened by the Romans, divides the site into two distinct parts. While there are no complete buildings, one can get a sense of the layout and distinguish private habitations. One, the Casa di Leda, has a fascinating fresco showing Zeus in the guise of a swan seducing the lady in question. The Gymnasium, a patrician residence, still has a few extant Doric columns and a section of entablature. Most of the houses were on two floors and often it is possible to see the staircases leading to now non-existent upper levels. There are also remains of the Agor?, the theatre (very difficult to make out) and an Odeon (a small theatre for musical performances). At the entrance there is an Antiquarium containing some of the artefacts found during excavations at the site.